Now an international favorite, blini are one of the oldest Slavic foods, dating back to the heathen tribes that worshipped the sun and created pancakes in its image. These earliest pancakes were called mliny, from the verb molot’ (“to grind”), and the word is still preserved in the Ukrainian, Serbian and Croatian tongues. Light and porous, blini are designed to soak up lots of butter. Traditionally, one is expected to gorge on blini. 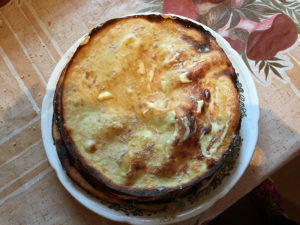 Literary and actual precedents are numerous in Russian life: Gogol’s Chichikov of Dead Souls finishes off nine of the pancakes while visiting the widow Korobochka, dipping them repeatedly in melted butter and gobbling them down three at a time, while the downfall of the nineteenth–century gourmand Lyapin was in the two dozen blini he once consumed before dinner. If, however, the first blin you make turns out badly, don’t despair. The Russians have a saying for this (as for every) eventuality: “Pervyi blin komom” — “The first blin’s a lump.” In other words, if at first you don’t succeed, try, try again. I myself like to consider this first blin the cook’s prerogative and pop it right into my mouth. Dissolve the yeast in ¼ cup of the milk, heated to lukewarm. Then stir in the sugar and 1¼ cups more of the milk. Add the buckwheat flour and stir briskly to mix. There should not be any lumps. Cover the sponge mixture and let rise in a warm place for 1 hour. Beat the cream until stiff. Beat the egg whites until stiff but not dry and fold them into the cream. Fold this mixture into the batter. Then let the batter rest for 30 minutes more (if the batter seems too thick at this point, a little warmed milk may be carefully added). Heat one or several cast-iron pans. Brush with butter (and a little vegetable oil, if desired); when the butter is hot, the pans are ready. Use 2 tablespoons of the batter for each blin, taking it from the top of the batter each time so that the rest doesn’t fall. Pour it onto the prepared pan and swirl the pan to make a pancake about 5 inches in diameter. Cook the blin for just a few minutes, until bubbles appear on the surface, then turn and cook the other side until faintly browned. The blini are best served hot from the pan, but if they must be held, pile them in a deep dish, brushing each one with butter, and cover the top of the dish with a linen towel.